In the world of a professional mobile DJ or working musician the focus has traditionally been on how to generate music for events. Priorities have focused on mixers, speakers and instruments, but lighting has become another prerequisite to help create dynamic visual effects while adding elegant ambiance to events. Once effect lighting is added to your mobile DJ rig, you shouldn’t have to worry about how your lighting is controlled, when your focus is on entertainment…That’s where BTAir, CHAUVET DJ’s new wireless Bluetooth® technology shines! 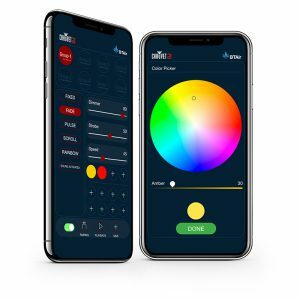 BTAir is a revolutionary new free app available on iOS and Android platforms that turns your phone or tablet into a wireless lighting controller that works with CHAUVET DJ Bluetooth® enabled lights right from your smartphone or tablet without any additional hardware. With a simple touch of a button, you can easily add a splash of color to a small event space, or even a dynamic chase or strobe effect to the dance floor. Imagine you’re an MC for a smaller sized wedding, maybe 100 guests in a conservatively sized banquet hall and you’re the sole operator on this gig. How are you going to simultaneously make a grand entrance announcement while playing music and controlling your lighting rig? Simple, BTAir App turns your tablet into a wireless lighting controller! Have your announcements on your tablet, as you’re making your entrance announcements, swipe to the BTAir app and set the mood with a touch of a button, lighting up the space in a warm, elegant glow, then easily swipe back to your announcements and continue your introductions without missing a beat. Pretend you’re playing piano in a café and you’ve got a handful of keys and no time to operate a separate computer based lighting controller or lighting console. What you do have is a tablet with sheet music on it and BTAir App running in the background. Again, simply swipe over to BTAir and select an auto-program preset for the ballad you’re about to perform. The space glows with an elegant wash light allowing you to focus on playing the song. In either of these cases, the key is to remember the relationship between Bluetooth® wireless technology, the event space and application. Think of how Bluetooth® wireless technology works with other things like wireless headphones, if you connect your headphones then walk outside, chances are you will lose connection. That’s why BTAir is designed to work in small event spaces like cafes, small banquet rooms or even house parties. Make sure you’re using the right lighting fixtures for the event type, there are many other tools for wireless lighting control for larger events with higher fixture counts that could work better depending on application. But for the single-op mobile DJ focused on smaller weddings or bar gigs, the musical combo or solo performer, great effect lighting is just a button push away with CHAUVET DJ’s BTAir App.